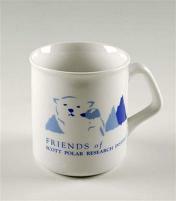 For various celebrations and life events, I often receive polar and/or literary themed gifts. 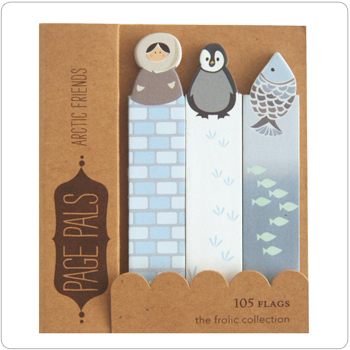 A favorite to both give and receive are sticky book tabs in beautiful patterns, fun prints and creative shapes. To be honest, I often have a hard time using them–especially if they are from The Girl of All Work Co. They’re just so perky it seems a shame to use them for something so mundane as research! This preamble is just to say, DO NOT STOP GIVING ME POLAR AND/OR LITERARY THEMED GIFTS! I love them! I love them all! Truly, I do. But that is not going to stop me from being the cultural critic I am. As the environmental theorist Greg Garrard once said when introducing the eco/feminist/queer theorist Catriona Sandilands and her book project about the gendered spaces of Canada’s national parks (you can read an article by her here), “cultural studies scholars are no fun to take anywhere.” And they certainly know how to look a gift horse in the mouth. So what is wrong with the above picture? We have some “arctic friends” happily hanging out together, ready to forever point out an important sentence in the middle of a book for my later retrieving pleasure; a fur-clad Inuk, a penguin, and, uh, a tuna? salmon? parrot fish? let’s say salmon. WHAT?!! A PENGUIN?! Leaving aside the problematic representation of an “Eskimo” stereotype and the unidentifiable fish, let’s focus on this rather globe-trotting penguin. Despite what you may read on the internet, find in an Etsy shop or discover in a pamphlet celebrating multiculturalism from the ’70s, penguins do. not. live. in the Arctic. But why does this myth persist well into the second millennium? If it has accurately been documented by Inuit, by scientists, by environmentalists, by all sorts of travelers, that penguins do not inhabit the northern polar regions except in zoos, why do people want to persist with the myth that penguins do live in the north, why is it so effective to label a sticky tab, woodblock or print of penguins as “arctic” in some shape or form? According to geographers, the Arctic includes the Arctic Ocean and parts of Canada, Greenland, Russia, the United States (Alaska), Iceland, Norway, Sweden and Finland. One often used boundary is demarcated by the Arctic Circle (at 66° 33’N), which is the approximate limit of the midnight sun and the polar night. Other definitions are based on climate and ecology, such as the 10°C (50° F) July isotherm, which roughly corresponds to the tree line in most of the Arctic. Socially and Politically, the Arctic region can include the northern territories of the eight Arctic states, including (in Fenno-Scandinavia) Lapland/Sápmi, although by natural science definitions much of this territory is considered subarctic (xii). Nowhere is it indicated that “arctic” also encompasses the southern pole–except in the name “Antarctica,” which, with the prefix “ant(i)-” means opposite, on the other side from the Arctic. When I bought the souvenir mug (because I do like polar bears and I do like penguins and I thought it was hilarious that a scientific research institution had so thoroughly and successfully collapsed the geography between the poles), the sales associate quipped that it’s probably the only place one can find a polar bear and a penguin in the same space. I rejoined that if anyone can bring the two polar species together, it would be the SPRI. But as the mug and the book tabs demonstrate, penguins sell. People like movies that feature penguins (March of the Penguins, Happy Feet no. ad nauseam, etc. Even Werner Herzog in Encounters at the End of the World, who swore he would not make another antarctic film about penguins, features a penguin experiencing an existential crisis as he heads towards the mountains instead of the sea). There are plenty of charismatic avian species up north that would display beautifully. There is the brightly billed puffin (my grade school mascot! ); the snow bunting; arctic tern; the amazing guillemot’s that lay, hatch and rear their young on cliffs that the flightless birds have to jump off of to reach the sea; and many more. What have penguins got that these birds don’t? They are known. They are endearing. They are non-threatening. They are a shorthand for a set of relations between people and a remote location. They are not predators like polar bears who are also an endearing shorthand, among other things, for climate change and environmental responsibility. Although many penguin species are endangered–some of the most adorable!–they are remote enough, contained enough, talked about enough, people-less enough, to be, when artistically figured, whatever we want them to mean. With a rolly-polly Eskimo caricature that has also been emptied of any engaged relation to actual people living and surviving political, economic, social and environmental upheaval, the penguin assures us that these images are not real. They are a fantasy, a soothing bit of slightly quirky and fun imagination, the Urban Outfitter of exotica. Art is never politically neutral, and mass produced craft is even less so. Let’s make a future for these creatures and their homes (in the south pole or the north) from whence we can look at a misidentified “arctic” penguin knickknack as a kitsch curiosity from a less enlightened past. Hopefully, it will be a future full of penguins, polar bears and puffins.